I love that the skull,is so tiny! That's so cute!! I would gladly add that to my delicate jewelry collection. I also follow on GFC. 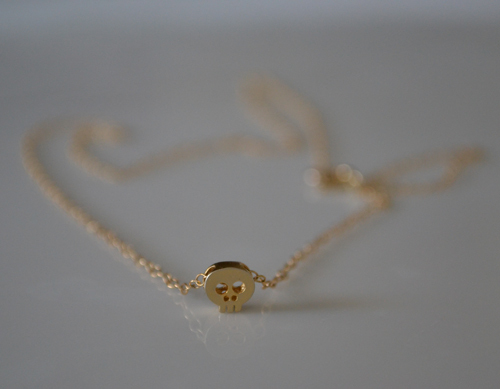 such a cute necklace! checking out that etsy shop immediately. Is there such thing as a classic skull?! If so, this might be it! This is soo pretty! Thank you so much for sharing! I already follow you on Twitter and GFC. Hope you have a fab weekend lady! I really really really love this necklace. It would be perfect to wear with a small dove necklace that I have. I already followed you on twitter and I don´t check GFC but I do follow you on Bloglovin! You are in my daily reads folder! Thanks for sharing this giveaway Audrey! I hope your little one is coming along well! I follow you on GFC. 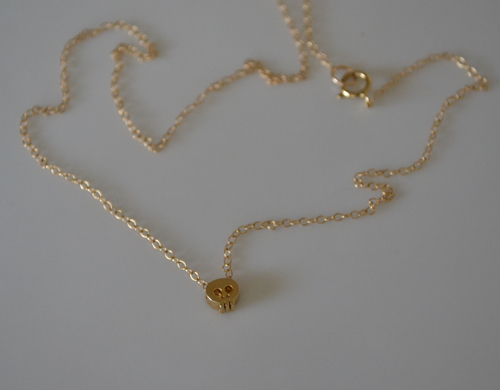 Love the skull necklace! What a great piece! Thanks for the giveaway! Following on Twitter and GFC! Oooo that's gorgeous! jessica.shia at gmail dot com! My sister would love this! Thanks! already follow you on twitter!! great giveaway! love your site audrey! i follow you on twitter (love your twitpic of the verrazano bridge!) and on gfc! love this giveaway and the necklace. so delicate and so pretty. I love etsy jewelry! Thanks for the giveaway! So cool! Thanks for the opportunity! Also, my email is ambercanread (at) gmail (dot) com. Fingers crossed! I would love to add this little ditty to my jewelry tree!!! Um, YES. I just posted a very similar necklace on my own blog last week - LOVE it. Sign me up, mamacita, and thanks for the opportunity!! merciblahblah at gmail dot com. That is a super cute necklace! It would look amazing with a simple black tee. So cute. I would love to wear this! Please count me in!! I love everything skulls. My email is inspirationsinitaly@gmail.com and I am already following you on twitter! i need this on my neck, like yesterday! 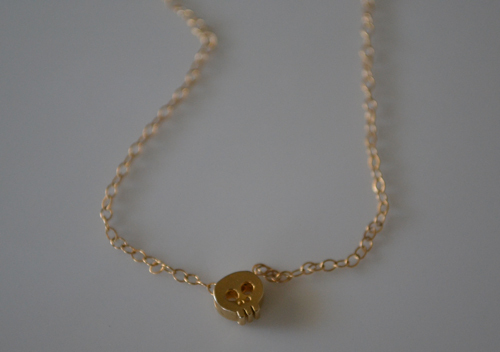 I love skulls, but most of the jewelry is too big. This size is perfect. Yay! Tala Stone and her crafty artistry; this necklace is phenomenal.